The French population of Detroit was always small, never amounting to more than a few thousand. After 1796, some U. S. residents came to Detroit from the eastern seaboard, but the trip was an arduous one, so the city's population increased very lethargically. After completion of the Erie Canal in 1825, a larger flow trekked from New York to Buffalo or Dunkirk and then sailed across Lake Erie to the city Cadillac founded. Irish from Cork County were the first to arrive in significant numbers, reaching Detroit in the 1830s. They settled in Corktown which retains a distinctive status among Detroit's many ethnic neighborhoods. The somewhat more prosperous Germans—almost all of them Protestants or Catholics—arrived either concurrently with the Irish or shortly thereafter. We usually assume that German migration to the US escalated after the agricultural troubles in Germany in the mid-1840s and the Revolution in 1848. Detroit had a growing German population about a decade earlier. The unique street plan for Detroit that Judge Augustus Woodward designed with the assistance of Pierre L'Enfant created puzzling street intersections and parks that survive to this day and continue to confound individuals who expect a rectangular plat in what was the world's most important city in the Twentieth Century. The result of L'Enfant's plan was the unusually shaped Capitol Park on the west side of downtown and Harmonie Park on the east side. 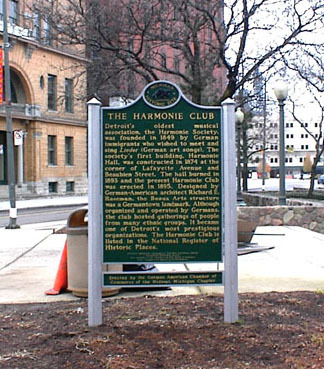 Harmonie Park was home to the first residential concentration of Germans in Detroit. As the German population grew and prospered in the commercial center Detroit became in the pre-Civil War era, they sought to preserve their cultural traditions. In 1849, German immigrants founded a group to promote the singing of lieder: the Gesang-Verein Harmonie. 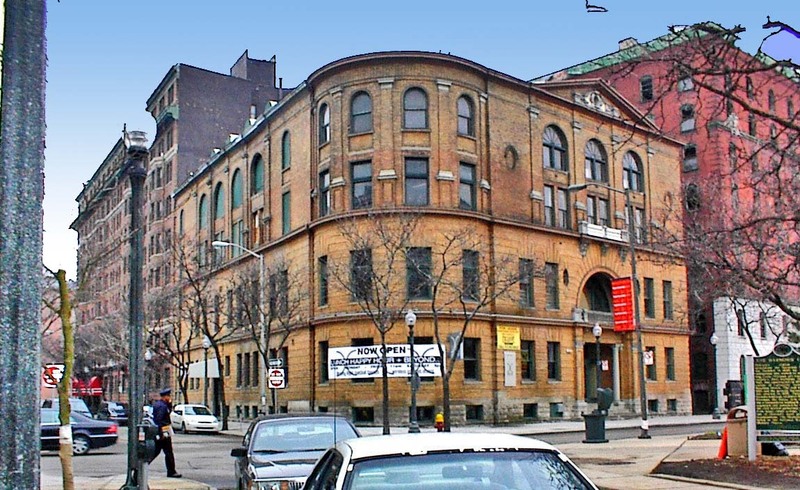 In 1874, this organization built a frame clubhouse at the corner of Lafayette and Beaubien. By 1880, German immigrants and their children made up one-fifth of the city's population. Most of them lived close to the city's center between Gratiot and Jefferson. The Harmonie Club structure burned in 1893. Almost immediately they organized a competition for the design of a new building, but in those days prior to equal employment opportunities, they restricted it to German American architects. Richard Raseman who also designed the impressive GAR Building on Grand River but on West Grand River, won that competition. Raseman created the strikingly attractive building that you see now. At the base, you see very small windows peeking out the basement, allowing a little of the sun's light to get below ground. Then there are two brick-faced stories embellished by appealing stone work. On top of those two floors are two additional floors with banding to make them very appealing. You will also notice the carefully designed curving windows on the fourth above-ground floor that add grace and style to this comely building. The masonry and brick work on this building are outstanding. On a warm spring day, with glorious sunlight, this building will remind you of the best urban architectural of the late Victorian age. The Harmonie Club apparently went out of business in 1974 and sold this building. Harmonie Park, however, plays a key role in the revitalization of downtown Detroit since it is located one-half way between the new stadia and the Greektown entertainment district. Harmonie Park was the site of the first—or second if you consider the Athenaeum in Greektown—new hotel to be built in downtown Detroit since 1965; the Harmonie Park Hilton that broke ground in 2003. Use in 2003: There is a bar operating in the basement. Plans are underway to open a bar, restaurant, night club on the upper floors. State of Michigan Historic Marker: None has been erected for this building but there is a State of Michigan Historic marker commenorating the German settlement in Harmonie Park.